This entry was posted on Tuesday, September 6th, 2016 by Frances Ryan. I broke my ankle a little over six weeks ago. At first, there was a bit of novelty to my first-ever broken bone. After a couple of days, I was becoming very unhappy with the lack of mobility—and the pain! However, there was very little I could do at the time other than let nature take its healing course. But now I’m ready for Phase II: Learning to walk again! 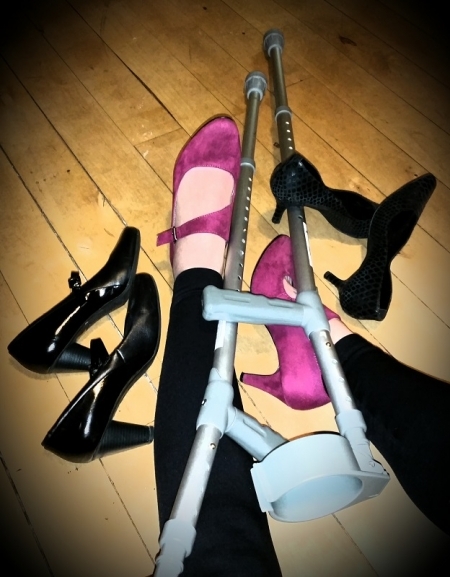 Broken Ankle: Phase I was six weeks of relative immobility. (For my ankle, not my entire being.) I spent those six weeks wearing a sturdy walking boot. For the first four weeks, I removed the boot for sleeping and bathing—but that was it. But the last two weeks I removed the boot twice a day for stretching and flexing exercises, which helped to prepare me for Phase II. However, at no point did I do any weight-bearing exercises, nor did I do any walking without the boot. Broken Ankle: Phase II began yesterday and will be completed in six weeks’ time (assuming everything goes well). In Phase II, I will be working to walk without the boot. It will be a slow process, but each day I hope to be able to spend a little bit more time walking on my own. It will be a painful process, too, but I suppose that comes with the “broken” territory! Of course, Phase II isn’t just strengthening my ankle for walking, it’s also re-building and strengthening my calf which has suffered from muscle atrophy. I’ve already noticed that the lack of muscle is making walking difficult, but hopefully I will manage to rebuild it quickly now that I’m able to do weight-bearing exercises. Frustratingly, after just one day of Phase II the muscle has already started to protest the extra work I’m asking it to do. But I suppose that’s just my body’s way of reminding me not to push too hard too fast! But then, I’ll be off to Croatia for a week to attend (and present a paper at) an academic conference. That will be the third week of Phase II, and I don’t think I will be able to spend an entire day without the boot—especially when I’m at a conference where there will be plenty of walking and standing! So, again, I’m thinking that I might go boot-less at the hotel in the mornings and evenings, then wear the boot to the conference. I will also try to remove the boot throughout the day for some extra strengthening exercises. A couple of days after I’m done housesitting, I will be heading off to Denmark for another academic conference. By then, I will be on the last half of the sixth week of Phase II. My hope is that I will be strong enough to be completely boot-less before I finish housesitting, so that I can head off to Denmark without worrying about my walking boot. Broken Ankle: Phase III will begin as soon as Phase II ends, which will be October 16th. By then, I should will be completely out of the walking boot. I will also be allowed to run at this point, though as I will be travelling I will hold off another week to attempt running. And even then, I’ll be taking it very slowly! I don’t know how long Phase III will last, as it’s the “getting back to normal” phase. And I’m told that it can take several months to fully recover after Phase II ends. I really am looking forward to the day when I can run and jump and climb again without pain and worry!